Get Your Family On Their Bikes for Boulder’s Winter Bike Week! Boulder Families – It’s Almost Winter Bike Week! Maybe this can be your family’s challenge to get on those bikes this winter. Bike to work. Bike to school. Bike around town. Bike in the winter! 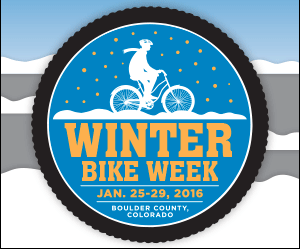 All Boulder residents are encouraged to participate in Winter Bike Week from Jan. 25 to Jan. 29. This week-long event is a partnership between The City of Boulder, Boulder County, the Boulder Valley School District and the University of Colorado. The event is coordinated by Community Cycles. Riders register as individuals or as part of a team to track bike trips and earn recognition and prizes. Registered riders will also enjoy free breakfasts and snacks along their routes [on 1/27] as well as pastries along the bike path [1/29].- check for food locations here. For more information and to register go to lovetoride.net/boulder. This entry was posted in Events, Exercise, Families, Get Outdoors, Giveaway and tagged 2016, Bike to School, Bike to Work, Boulder, Colorado, Cycle, January, Winter Bike Week by Boulder Families. Bookmark the permalink.